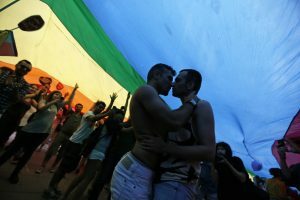 Government leaders said Friday they would not allow Istanbul’s gay pride parade to go forward, citing safety concerns. “We ask our valuable Istanbul residents to not heed such calls [to march in the parade] and to help the Security Forces by following their warnings,” the Istanbul governor’s office said in a statement. The city has been under tightened security in recent months following a series of terror attacks linked to the Islamic State group and Kurdish militants, The Guardian reported. The right-wing newspaper Yeni Akit also reported the news of the June 12 shooting at a gay nightclub in Orlando with a headline referring to victims as “perverts,” The Huffington Post reported. Despite the threats, parade organizers are speaking out against the ban. They promised to take the issue to court. “The governor’s office has chosen to waste human rights and freedoms rather than take precautions against threats,” the organizers of the LGBT Pride Week is quoted as saying in a statement on Facebook. Supporters also said on Twitter they wanted to march in solidarity with the Orlando victims. The parade, which is thought to be the largest pride parade in the Muslim world, was also shut down last year. Instanbul’s governor banned the event on the grounds that it coincided with Ramadan.